Summary: This article describes Content Delivery Networks (CDNs) and how you can use them to increase SharePoint Online performance. When creating pages for SharePoint Online, latency can be affected by the physical distance between your users and the location of the SharePoint Online instance. This is particularly important for organizations that have a global presence where a site may be hosted on one continent while users on the other side of the world are accessing its content. CDNs help mitigate this situation by hosting certain popular web assets in different locations closer to the end users. Since a CDN is a worldwide network of servers that host the same files, Internet URLs for files stored on the CDNs are interpreted by the client machine so that the server that is closest to the user serves the file. Doing this significantly reduces delays caused by network round trips. SharePoint Online sites are hosted at datacenters relative to the location (specified by the user) selected when you signed up with Office 365. For example, if your site is on servers in the United States and you have users accessing the site from East Asia, latency issues might arise due to the distance the data has to travel over fiber optic cable. Using CDNs can improve page load times for a variety of reasons. One reason is that the distance between the CDN and the user may be shorter than the distance to the SharePoint Online instance. These networks are highly distributed and are also designed to have very high availability and response times. Another reason is that if you are using a popular library of CSS files, in conjunction with a CDN, the user may already have the library cached and they won't even need to download it at all. The following screen shots illustrate the advantages of using CDNs. These screen shots are from the Network tab in the Internet Explorer 11 developer tools. These screen shots show the latency on the popular library jQuery. To bring up this screen, in Internet Explorer, press F12 and select the Network tab which is symbolized with a Wi-Fi icon. This screen shot shows the library uploaded to the master page gallery on the SharePoint Online site itself. The time it took to upload the library is 1.51 seconds. The second screen shot shows the same file delivered by Microsoft's CDN. This time the latency is around 496 milliseconds. This is a large improvement and shows that a whole second is shaved off the total time to download the page content. 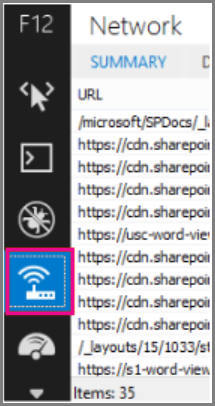 Using CDNs only makes sense in a SharePoint Online context and should be avoided with SharePoint Server 2013. This is because all of the advantages around geographic location do not hold true if the server is located on-premises or geographically close anyway. Additionally, if there is a network connection to the servers where it's hosted, then the site may be used without an Internet connection and therefore cannot retrieve the CDN files. Otherwise, you should use a CDN if there is one available and stable for the library and files you need for your site. Microsoft's Ajax CDN offers most of the popular libraries including jQuery (and all of its other libraries), ASP.NET Ajax, Bootstrap, Knockout.js, and many more. For more information about CDNs, see Content delivery networks.